Taking a little break from my Enterprise-B to work on something a bit "easier." I've always liked 2001 and the design of it's spacecraft so today I decided to start working on the Aries 1B. I've thrown together a little test rig to make sure I understood how the landing legs worked. Also a screenshot of where I'm at, sorta just roughing it all in now. Nice start on the Aries Lunar Lander. This is one of the first models I modeled in Cinema 4D and is fun to do. I found the book 'Filming The Future' by Piers Bizony an excellent resource for doing this model. Screen captures from the film help a lot as well. Looking forward to seeing more of this project. You will find that you may have to add additional action to the upper leg struts, as they are a pair of hydraulic pistons on the filming model. This action allows the bottom of the legs to pull in tight to the body. If you watch the landing sequence you will see this. There is also a piston attached to the foot pad to tilt them in towards the body as well. I just finished the master pattern for AJ Models' Aries model kit. I had to bread-board the legs to duplicate their action. Not to sound like a know-it-all, but the thrusters are not centered under the windows or the panels in between the windows. If you look closely at various shots of the filming model, not design drawings, you will see that they are off center in relation to the windows. It is actually the window placement that is not on the 90* mark. It is subtle, but noticeable once you get up to your neck in researching the model. I was, so that is how I discovered that positioning. They windows and leg openings are at 90* degrees in relation to each other and the hull. You are really going to have fun when it comes time to add the paneling to the top of the hull, around the windows. srspicer: Gah, you are right! I just took screenshots from the movie and see what you mean! It's hard to not get your head turned around on this one. Thanks for the heads up! Will fix that straight away. Haha, I see what I did now. In my brain I reversed what areas were supposed to be windows and which were not. oops! Got a couple render updates. Been working and reworking some of the dome paneling. The more I look at reference the more details pop out that I didn't see before! I feel like I've gotten the spacing and shape down pretty well. I've had to rebuild them a few times to give myself more resolution on the curves. I've found that I tend to get really wonky shadows on the curved surfaces if I don't give myself enough polygons. It might look fine visually, but the bad shadows give it all away. I've made a temporary interior to see how it all fits together. I hope to post more on that later. I found a few blu ray clips online, but none of the money shots of the exterior unfortunately. The moon base is AMAZING in blu ray, makes me want to build that too and put the Aries in there. Alas, I must finish this guy first . Does anyone have the blu ray of 2001? I'm looking for some better detailed screenshots from the movie than just my standard dvd. I feel like there is detail on the legs that is missing on a lot of the scale model photos I have and would like to get that down. Would be nice to get the outer facing area of the landing leg if possible. Thanks! Here's an update on the legs. This is probably about as close as they will get, it's as much as I could see with my refernece. They were surprisingly complex. I'll try rigging them up later. I need to add some pistons to the rotating leg cover as well. Noticed that it's there in the movie reference. Looks great. I appreciate your attention to detail. 2001 is really the beginning of all of this. I'm glad that you are spending the time to do it right. Damn Jappy-man, you just get better and better. I'm still in awe of your dirigible. Finest piece you've done IMO. Tho this one is a very close second. After a little break I started detailing the panels on the dome area. I'm about a third of the way done I think. Thanks Scott! Those will help! Overall I feel like I'm pretty close. A few of the places could probably have some toned down beveling, but I think I can modify that after the fact still. I've been using a lot of reference from the models over at modelermagic.com. I just went back there and stumbled across your model there too. Dunno why I didn't see it before! Sorry for reviving this old thread! Now that my Enterprise-B is done for the time being I'm working back on this guy. I've been adding a lot of detailing to the engines and started on the hatchway. Will post images soon! Got some updates! Been working on the engine areas and just started the doorway like I said. I've learned a lot about mental ray over the past 6 months! I think I might actually be able to complete this project in a reasonable amount of time for once, minus this break. I've noticed in the film reference there are some rods that come out to extend the leg cover that doesn't really seem to be present in the model photographs that are on the net. Anyone know how that works? In the photos of models I've seen there is a rod that attaches to the edge of the open leg cover but it doesn't extend. Is that the same thing just not extended? I feel like that's about the last thing I'm confused about. Anyway, renders! Looking really nice. The rocket details might be hard, but they're worth it. Updates to come soon, I believe I finished the outside (might need to add a few more doodads as i come across them) and I rigged the legs this morning. It's great to see them moving finally! A while ago I had started an interior so I think I will return to that soon and see how it looks. So recently I've received more reference of the filming model (thanks Phil!) and am going back and updating the engine areas with the correct detail as best I can. Thankfully most of mine was pretty close, but the scale model you can get nowadays has a number of incorrect areas. This time I was smart and color coded and numbered each engine in the reference so I'm not nearly as confused . Hope to make an updated post soon! A quick update with screenshots...been working on the cockpit interior more. I feel like it's not quite possible to fit the cockpit from teh filming set into the model, but I'm trying my best. It seems really crammed. 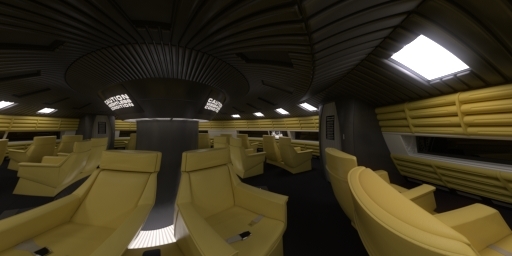 The passenger interior is built based on some blueprints of the set from the movie, but the cockpit is from screenshots. I at least know that the dimesions of the passenger area are correct. Will probably have to cheat the cockpit some to get it to work. And I don't even know how the galley fits inside!! Also like I said earlier I've improved the detail of the engines based on the filming model instead of the scale model. Progress looking good, glad you revived this thread also! You are correct, the cockpit does not fit in to the top of the ship. I mastered the passenger and cockpit interiors for AJA Models. The cockpit was for-shortened and forced perspective is the result of the finished cockpit, just about what you have indicated in your render. The galley does not fit at all. The passenger section fits perfectly into the model. As a matter of fact, the top of the elevator, the large beveled section, did not fit either. That was left out to accommodate the cockpit. The arms that extend to open the clam shell doors are pistons. They attach to the same surface as the main engines. There is one for the left and right side of the clamshells and they sit up on cylinders. I know because I have seen the images of the filming model that contain that area of deatialing. If you follow the link to my site below, you can look through the images and see those cylinders with the tubes mounted perpendicular on them. Those tubes hold the pistons that attach to the clamshells.